The chief of the Metropolitan Police has dismissed "overblown" speculation that the force could start using water cannon to handle violent protests. Sir Paul Stephenson said he was "reluctant to move towards paramilitary models of policing". 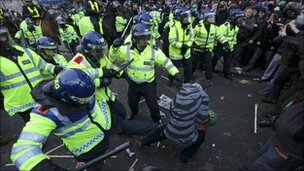 Scotland Yard said it had made 182 arrests linked to the student protests. Meanwhile, the police tactic of "kettling" to confine protesters during public demonstrations is to be challenged at the High Court. Bethany Shiner, 23, the daughter of high-profile human rights lawyer Phil Shiner, is launching proceedings against Sir Paul after being confined on Thursday in Trafalgar Square. Police used the tactic, hemming in protesters to restrict movement, when violence flared after thousands of students descended on central London to protest as MPs voted to raise the cap on university tuition fees to up to £9,000. Sir Paul said that one officer with 27 years' experience, including policing the Tottenham and poll tax riots, viewed last week's student protest as the "most sustained and serious level of violence he has witnessed". Det Ch Supt Matthew Horne, leading the investigation into the disorder, said only a minority of demonstrators had been intent on violence. A number of those arrested had turned up without intending to cause trouble. "When shown the footage they are extremely shocked by their own behaviour," he said. He added that he expected the number of arrests to "grow significantly" as officers worked their way through video footage. An internal report on the attack on the car carrying the Prince of Wales and Duchess of Cornwall in Regent Street last Thursday is due to be completed by the end of this week and passed to the Home Office. The royal couple's Rolls-Royce had a window smashed, was splattered with paint and kicked as protesters chanted "off with their heads". Sir Paul described the incident as "regrettable and shocking". He said that senior officers would consider applying to the home secretary to ban future marches, if necessary and if it would not inflame the situation, but he added this would be a "very difficult step to take". After ruling out the use of water cannon three years ago, Scotland Yard was now taking advice from colleagues in Northern Ireland on their use, Sir Paul said. But he added: "I am most reluctant to move towards paramilitary models of policing. We have seen the consequences across the world. "We don't want to engage in some sort of arms race with thugs and hooligans who have latched on to peaceful demonstrations and don't know how to behave." Ms Shiner and four sixth-form students, one of whom is a minor, are seeking a ruling that the use of kettling "as a standard response to protests" is unlawful. They complain they were detained for hours in sub-zero temperatures and not released until 1900 GMT. Mr Shiner's firm, Public Interest Lawyers, is applying for judicial review on their behalf, on the grounds it breaches their right to freedom of expression and assembly and the right not to be unlawfully detained. "It is outrageous that the police should resort to such tactics against all protesters, most of whom were acting peacefully," said Ms Shiner. IMO deploy ASAP and give the soap dodgers what they deserve! Students need to pay their way in life or get a job and pay up like the rest of us. Uni degrees are rarely directly used in further careers so do not benefit society to the extent we should foot the bill. If the students taking a degree are so determined they will get a well paid career from their studies then what is their problem in paying for the education that enabled that career? If the use of water cannon is justified in France and Belfast, what s so wrong about using it in London? Students latching onto "public sector cuts" as an excuse to protest. The American police had the best idea in the Sixties! As happened in the Raoul Moat standoff though (with the X-REP shotgun tasers), any kit can be brought in at a moments notice by Police as the power in law is there to do so. Home Office approval like Teresa May quotes is not necessarily required and really relates to 'routine' use of such pieces of hardware. I feel they should be used, a dose of cold water on a cold winters day will soon sort them out. Baton rounds! Or for those that are a little more determined, SP2 batteries followed by a baton round! What are water cannons anyway? If they are just large jets of water then why can't the fire brigade do it? Daisy wrote: What are water cannons anyway? If they are just large jets of water then why can't the fire brigade do it? Cause they'd be too busy on strike! Nighthawk wrote: Baton rounds! Or for those that are a little more determined, SP2 batteries followed by a baton round! Mmm - Sounds like someones served in Belfast! Vostapo wrote: IMO deploy ASAP and give the soap dodgers what they deserve! Students need to pay their way in life or get a job and pay up like the rest of us. Uni degrees are rarely directly used in further careers so do not benefit society to the extent we should foot the bill. If the students taking a degree are so determined they will get a well paid career from their studies then what is their problem in paying for the education that enabled that career? Our local Radio Station came up with a good idea. "If the Police are to use water cannons on demonstrating students, may we make a suggestion and urge them to add shampoo to the water".